Toxy.de Main page » Components, spares & accessories » Wheels & tires » Aero system wheelset 20" Toxy "lite-w8"
Toxy "lite-w8" 20 inch (406) system wheelset with 24 Sapim aero spokes, Toxy "lite-w8" CNC alloy D.B. 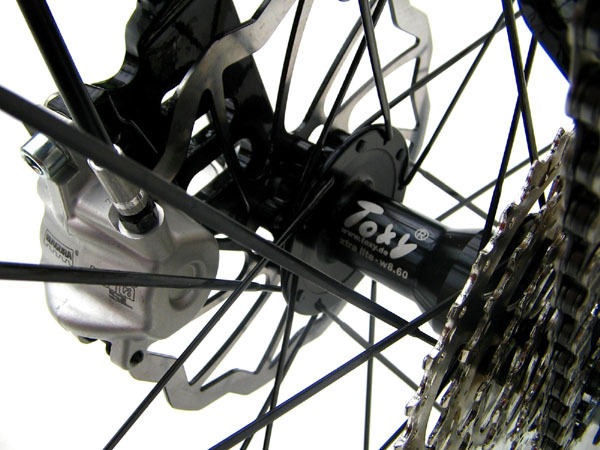 hubs, Toxy "lite-w8" CNC alloy rims with drilled brake flange (complete system weight 1230g only; weight reduction: 570g). For 27/18 or 24/16 speed chain drive only, max. tire width: 40mm.